SsangYong’s back catalogue is visually arresting, although not necessarily for the right reasons. 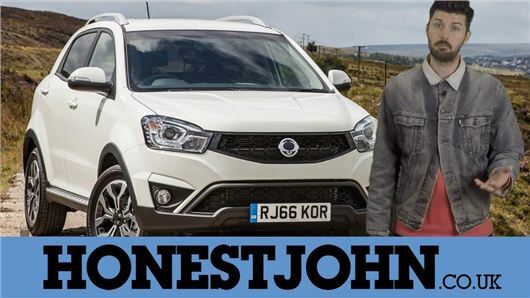 The Korando is certainly a step in the right direction in that sense, but elsewhere SsangYong’s crossover is sadly lacking. Mark talks you through it. Please click here to subscribe to our YouTube channel. It can be your good deed for the day. Thanks. Re Ssangyong road test I’m disappointed that tester wasn’t in my opinion the age group the vehicle is aimed at , I’m retired and test drove the same model and it did everything I require from a car ,with the bonus of a five year factory warranty ,and equipment level that is unmatched at the price . Fit and finish is a good as anything on the market , the quality of the seat stitching is exceptional at any price . Dave Lewis, what a refreshing critique, good to see that we oldies drive our conclusions with common sense ! I'm with the road tester (Mark Nichol) on this one- whilst it might be perfectly adequate for older drivers who value seat stitching over vehicle dynamics, but the car is mainly aimed at the younger family motorist rather than the retired. Having driven both, I'd say that the Qashqai (sp?) is by a long way the better car. Just as practical, but a bit more up-to-date whilst being as good to drive as a family-centred crossover can be (ie not as good as a hatchback but still very acceptable). There's just no need for mediocrity in vehicle design these days. The rivals set the bar too high. I'm with the road tester (Mark Nichol) on this one- whilst it might be perfectly adequate for older drivers who value seat stitching over vehicle dynamics, but the car is mainly aimed at the younger family motorist rather than the retired. Having driven both, I'd say that the Qashqai (sp?) is by a long way the better car. Just as practical, but a bit more up-to-date whilst being as good to drive as a family-centred crossover can be (ie not as good as a hatchback but still very acceptable). There's just no need for mediocrity in vehicle design these days. The rivals set the bar too high. I owned a Qashqai for 3 years and it was a superb car to drive. However it suffered from build quality problems, reliability problems and was backed up by a customer service organisation not fit for purpose. I'm also retired, but don't believe that a car is specifically designed for the older generation, unless you include a Honda Jazz! I am in the market for a 4X4, but do not want one that is wanting dynamically, does not drive well or is compromised by design. I've never driven a Korando, and probably never will. My current favourite is an F-Type Jag with a petrol engine.